At Island Vape Shop we strive to provide high quality vaping supplies at a fair price. We have a wide variety of products to suit everyone, from a first time Vaper to an experienced expert. Our selection is constantly growing, so stop by and test out the latest and greatest! We offer a variety of starter kits, e-liquids, and mods at all price points. We want to ensure that you get the most out of your vaping experience. If you've never vaped before, stop by and check out our affordable starter kits. We will walk you through the entire process, from choosing flavors, assembling your device, charging it, and maintaining it. We're here for you and provide face-to-face assistance with every piece of equipment sold. Starter Kits start at $19.95 and have everything you need to get started. If you decide that vaping is a superior alternative to smoking, all starter kit parts are compatible with our more advanced components, mean you build a vaping setup to suit you over time! Along with starter kits, Isand Vape Shop stocks a large variety of more advanced hardware from industry leaders including Kanger, Innokin, Joyetech, Smoktech, Aspire, Vision, Sigelei, Clouper, Pioneer4You, Ovale, and Provari. All of the products we sell have been tested by our staff to ensure they perform to our high standards. Stop in to experience our collection of vaping hardware today. E-Liquid, Juice, Nicotine Fluid, whatever you call it, it's the most important part of your vaping experience. Island Vape Shop only sells the highest quality, american made, AEMSA certified e-liquids from some of the best manufactures in the country. We want our vendors to be as transparent as possible in their production process so that we deliver the highest quality product to you. Below you can find more information about our e-liquid suppliers. Our suppliers include We carry a huge variety of e-liquid flavors that are sure to be a fit for anybody's taste. We carry over 35 brands including, Five Pawns Signature and Mixology Vapor Liquid, Space Jam, Obsession, Taste, Drakes, Moon Mountain Vapor Maximum Velocity, Journey Juice, Powerhouse Vapors, Cosmic Fog, Uncle Junk's, Cuttwood, Blueprint, The Standard Vape, Firebrand Liquitine, Sub-Ohm, Big Bang Bomb Sauce, Rasta Vapors, Dajuice Hawaii, Evo E-Liquid, Halo E-Liquid, Hold Fast Vapors, CRFT True Artisan, Prime Vapor G2, ORENDA Seed of Life, NJOY Artist Collection NJOYAC, Outlaw E-Liquid, REMIX, NUBZ Vape, and White Rhino E-Liquid. AEMSA is the American E-Liquid Manufacturing Standards Association, the first and only Manufacturers' trade association completely dedicated to creating responsible and sustainable standards for the safe manufacturing of "e-liquids" used in electronic cigarettes. AEMSA is an all-volunteer organization, formed by American manufacturers of e-liquids, to promote safety and responsibility through self-regulation. AEMSA members are required to follow strict guidelines and processes to produce products that are safe to vape. Since the electronic cigarette industry is currently unregulated, it is important to have an organization dedicated to providing and enforcing standards and best practices and ensuring only ingredients that are generally regarded as safe (GRAS) are used in the production process. Island Vape Shop, in an effort to provide a superior vaping experience, only sells e-liquids produced by AEMSA certified manufacturers. NicVape is a manufacturer, retailer and wholesale supplier of the highest quality e-liquids and diluted nicotine available in the electronic cigarette market. We are committed in our mission To provide the highest quality e-liquids and vaping products, while maintaining policies and procedures that set the standard for quality control, exacting production, and stellar customer service. NicVape was founded by entrepreneur Rich Henning in 2010. What began as an effort to find a smoking alternative for himself and his family has turned into a "USA Top-10" e-liquid manufacturing company, producing e-liquids and diluted nicotine for the worldwide marketplace. All NicVape e-liquid is made in a certified clean room in Spartanburg, South Carolina. We are happy to have NicVape as a supplier of top quality e-liquid at a fair price. NicQuid simply makes fantastic e-liquid. Period. Great care and artistry is a part of the flavor creation process. Their team of experts spends months testing each flavor and hand selects each high quality ingredient. They allow for extensive steep (saturation over time) variances, before taking a new creation forward for final review and adding it to their e-liquid line. All products go through extensive testing before they leave the factory. Their mission is to deliver a product that is unrivaled in the marketplace, with unmatched quality and flavor, and to obtain and maintain the highest level of industry standards. They are one of the only e-liquid companies that completely manufactures all e-liquid in an ISO Class 6 / FED STD 209E Class 1000 Clean Room. They have produced a brilliant e-liquid line, consisting of four collections that taste as delicious on day thirty as they did on day one. NicQuid does not rush numerous new flavors to market just to increase their catalog. Every offering is hand crafted to meet their (and your) exceedingly high standards. 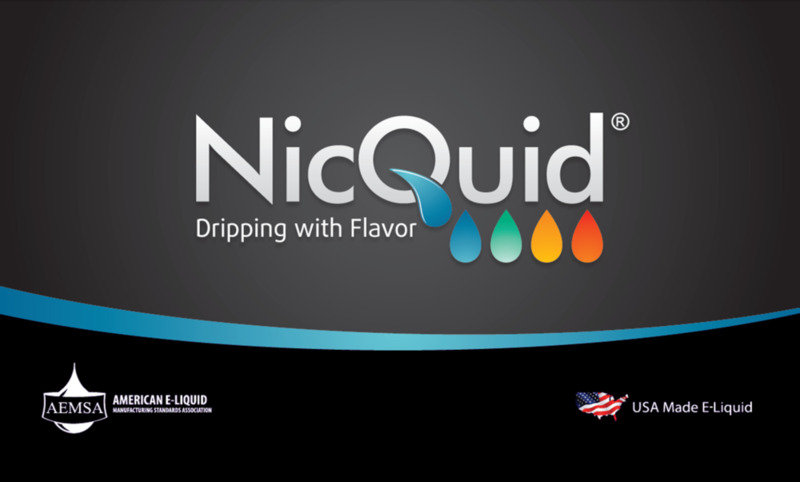 NicQuid® places special emphasis on making exciting, bold, and flavorful e-liquid creations, and puts an equal amount of care and consideration into the components and facility used in delivering a product that is pure, clean and secure - expenses that will never be spared. Rest assured that when you purchase a NicQuid® e-liquid, you are getting the best. Simply put, e-liquid is their passion. Firebrand was founded in July 2010 to develop great e-liquid. All of their products are developed using USP certified and Generally Regarded As Safe (GRAS) ingredients in a 1,000 square foot AEMSA certified clean room in downtown Los Angeles. Firebrand products are bold and original, with tons of variety. No matter what your palate, there is a Firebrand liquid for your style. Firebrand prides themselves on a quality standard higher than most convention e-liquids. The standard is so high they regard their product, not as e-liquid, but "Liquitine".